Real Madrid goalkeeper Thibaut Courtois received plenty of criticism from Chelsea fans after shipping four goals against Ajax in the Champions League. The Blancos were beaten 4-1 at Santiago Bernabeu on Tuesday night, with the Dutch giants advancing to the quarterfinals of the competition 5-3 on aggregate. Madrid have won the European Cup in three successive seasons, but they have been a shadow of their former selves during the 2018-19 campaign which now looks destined to finish trophyless. Ajax outplayed the Spanish giants from the start, taking the lead after just seven minutes through Hakim Ziyech. It was two ten minutes later, with David Neres scoring after outstanding work from Dusan Tadic in midfield. Tadic then managed to get himself on the scoresheet on the hour mark, before Lasse Schone made sure of victory with an outstanding free kick late in the game. Schone’s strike left Courtois red-faced, as the Danish midfielder somehow managed to loop the deal ball into the net from a seemingly impossible angle. Courtois is one of the tallest ‘keepers in Europen football and yet somehow he was deceived by the flight of the ball, which invited Chelsea fans to jump on the mistake on social media. As you can see in the tweet above, one Chelsea supporter labelled the Belgian as a “snake”, referring to his big money move to Madrid from Chelsea last summer. Some Blues supporters could not resist taking a jab at their club’s former shot-stopper, who moved to the Bernabeu in search of consistent major trophies. 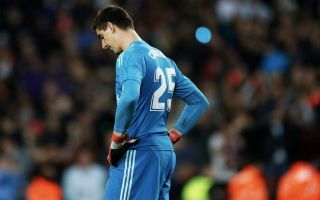 Ironically, his debut season in Madrid will end without silverware and his reputation has taken another huge dive in the wake of the team’s latest result. Check out some more comments from Chelsea fans below, via Twitter. You’ve f*cked off Atletico fans cos you joined their rivals. You f*cked off Chelsea fans cos you forced your way out. And you join Real Madrid just to join the end of an era as everyone has already won everything there is to win there. Thibaut Courtois blocking me seems to be the only block he’s made all season ???? Who’s a better goal keeper? Courtois is getting the karma he deserves ? Real Madrid and Courtois getting humiliated. You love to see it. Real Madrid did not need a new goalkeeper. Their De Gea obsession made them totally lose sight of the fact that Keylor Navas was (and still is) solid! Now, they’re stuck with Courtois, while the better GK is on the bench.